Business is good for metalheads in Hong Kong this year. After Metallica blew the audience away at AsiaWorld-Expo in January, another of thrash metal’s ‘big four’ is coming to our eager city. 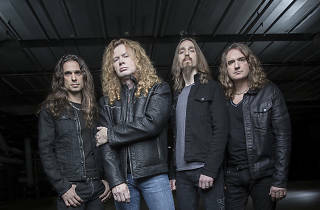 This Wednesday Californian legends Megadeth bring their Dystopia World Tour to KITEC. Pioneers of thrash and creators of seminal albums such as Peace Sells... But Who's Buying? and Countdown to Extinction, Megadeth are still going strong more than 30 years after their formation, winning their first-ever Grammy last year courtesy of the single, Dystopia. Hi Dave! So Megadeth play Hong Kong on May 10 and we’re excited! Is this the first time you’re played our city? Yes, really glad we are finally making it to Hong Kong! This is our second tour of China, so happy that Hong Kong is part of this tour. What is it about Hong Kong, and Asia for that matter, that’s so appealing when it comes to staging an epic gig? Our first trip to Asia was Japan in 1987 on the “Peace Sells…” tour. We noticed even then, that our music reaches across all borders, ethnicity, politics or creed. It’s truly a music for all people in all nations. At the same time, each nation has its own peculiar style, which we find fascinating as performers. We assume the same will true in Hong Kong. You follow hot on the heels of Metallica’s show in January. As one of the 'big four', are you guys noticing a hunger for big metal gigs in our city and why? From the stage, it’s almost like all metal heads are the same no matter where we go. It’s almost as if we forget we are in foreign cities because the fans are the same everywhere. That is what is so cool about metal fans, we all think alike when it comes to our music, our culture and our fellowship together. Metal is like no other type of culture or breed. It can be a conservative crowd in Hong Kong but we get rocking when the bass – your bass – starts thrashing. What sort of crowd are you hoping for? We’ve played for the most conservative and the most rowdy nations on the planet, and once we take the stage, that venue becomes ours… really at one with us and the fans. I’m thinking HK will be no different and we can’t wait to have the experience with the people at the show. Any new material for the Hong Kong show? Each show we alter the set list. Last night we added more songs to the set, and we often change them around so each city has a new experience. We’ll see what happens in Hong Kong! We know – or at least we hope – we’ll get Symphony of Destruction and A Tout Le Monde but are you going to bring in any off-the-wall tracks for us from like the Endgame or Thirteen albums perhaps? We have a really tight and cohesive list of songs that work really well. We have the classics as well as the newer material. We usually create the set list on the day of the show based on the feeling we have that day in each city. We loved Dystopia last year. Any new album plans to follow up on the record? We are just now talking about the next record. While it’s really too early to tell what it will sound like, we are getting anxious to start writing new material soon. We interviewed Robert Trujillo of Metallica when he was in town and he told us the band’s music seems 'fresh' after so many years. Is this the same for Megadeth? There’s a new-found 'freshness' to the band? Absolutely! Megadeth songs really are timeless. We won’t play a certain song for many years and suddenly we play it and it sounds very natural in the set list with the newer songs, too. Plus, with the energy of Dystopia and the new lineup, there’s a terrific energy in the band that everyone notices in the live show. Gushing moment: you’re quite simply one of the best bassists in metal history. How have you developed your unique style over the years? It started with a blank slate when I met Dave [Mustaine] in 1983 and we began composing the material. We determined that I was not only gonna play heavy bass lines, but also “lead bass”, meaning the bass was not going to be a background instrument in the band, but rather an instrument way up front in the band. I think we accomplished that from the very earliest days and songs. And how has Dave Mustaine’s guitar and vox transformed as you develop your style over the years? Dave mostly creates the riffs of the band, and those riffs are the building blocks and foundation of the songs. From there, I try and play with and in between the guitar and drums. I’m like the mortar poured between the foundation blocks of the songs. Who would you rate as young metal acts to watch in the future? I’m interested to see what the next Ghost album is like. I’m a big fan of their sound and am enjoying how it has developed. With my label EMP Label Group, I now come across a lot of really great young talent as well. One of those that I really like is the new Next 2 None album (featuring Max Portnoy) and also this killer young band from the USA called Power Trip. I like that there is now a movement toward metal bands having good singers once again. I like to hear melody and aggression. There’s a good metal scene rising in Asia. Bands like Babymetal are leading the way. What interests you about this new wave Asian metal scene? It’s time that Asia had a thriving metal scene. I’m excited to see what type of bands come out of Asia these next few years. Most of the Asian pop music doesn’t really reach audiences outside of Asia. I’m hoping that’ll change soon. With my label, we are doing partnerships with Asian distributors now, which is really helping me have my ear to the ground with Asian bands. I find it an exciting new frontier for all kinds of heavy music. Any messages for those HK fans who don’t really know Megadeth but want to come along? Megadeth’s live show is something really special with its energy, music and bringing together the metal community. I think fans will be really happy with the show and have a really fun night out with other metal heads. Anything you’re going to eat and do while you’re in HK? I’m always liking to eat either great local food, or at least from restaurants that are well liked from the region. 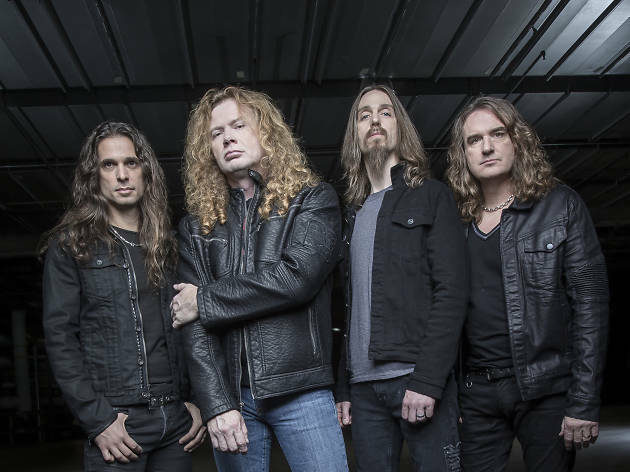 What does the future hold for Megadeth? We are still working very hard behind the success of Dystopia. The album is a top favorite of our fans everywhere, which means we still have a lot of this big world to cover before we wrap up the world tour.